Draft#1 SRTM derived elevation of India’s southern Western Ghats. The red lines highlight the 1,500 meter contour- roughly where shola/grasslands mosaic ecosystems start. This is a map in progress and it de-emphasizes political boundaries and settlements. Click on image for a larger 150 dpi A3 version. Since my first geography lessons I have been interested in cartography and the art & science of depicting the earth’s surface. It was my Grade 4 teacher Kris Riber –also a KIS graduate- who got me interested in maps. We each had to do a study of an Indian state (mine was Meghalaya) and part of the task was to make a large, gridded map of our state. Since then I have enjoyed making sketch maps and have searched for the best printed maps of my areas of interest. In India is not easy and it continues to be a great challenge to acquire maps of some places, given restrictions and general bureaucratic barriers that make getting maps challenging. I persevered and now have most of the 1:50,000 and some 1:25,000 scale Survey of India topo sheets for the significant ranges of the Western Ghats. Some of these came from my grandfather Edson Lockwood and are early 20th Century editions where the cartography is at a highly refined level. In the 1990s I was exposed to Tactical Pilotage Charts of the Western Ghats and North East India (see the University of Texas Library site for free downloads). These are at a scale of 1:500,000 but depict the relief and elevation very accurately (see sample below). The advent of modern Geographic Information Systems (GIS) and web-based tools have allowed me to dabble in mapping the areas that are the subject of my photo-documentation and writing. Last year USGS released a new 30-meter SRTM dataset for the world that allows mapmakers using GIS to more accurately depict relief and elevation. I was very interested in depicting the relief of the Palanis and other ranges more accurately. Over the last few months I have downloaded the tiles for Sri Lanka and southern India and am starting to use them to more accurately depict elevation in my areas of interest. I used a mosaic of about nine SRTM 30-meter tiles to create this year’s WWW Sri Lanka map. 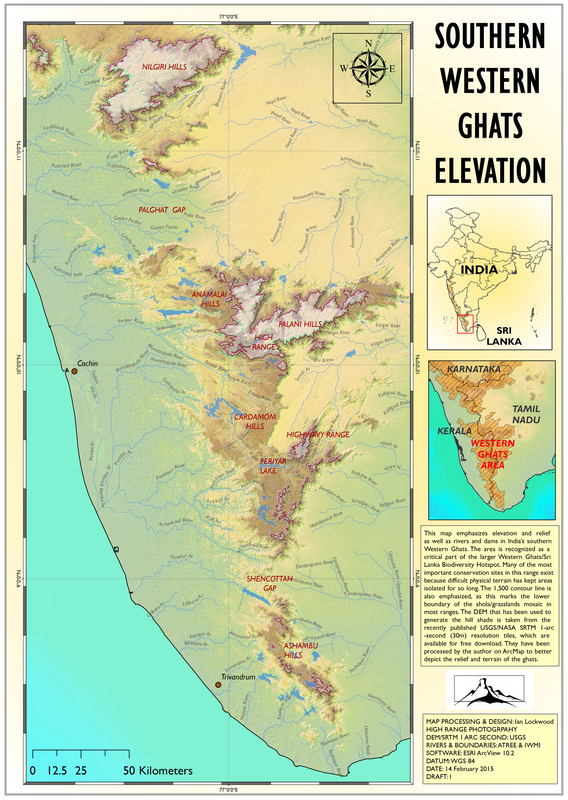 The map above was made to help my friends working on shola/grasslands landscapes in the southern Western Ghats (see post on “Forest Plantations”). The goal was to depict the spatial relationship of the “sky islands” (above 1,500 meters) of the Western Ghats where this vegetation type was once dominant. There are several places to download SRTM tiles. I used Earthexplorer to download the Sri Lanka and southern India tiles. ESRI’s ArcGIS online will shortly have 30-meter DEM tiles available to use as background imagery. Because we have dedicated licensed software I tend not to use the online versions. At the moment ESRI offers this data for all the continues except Australia and Asia. 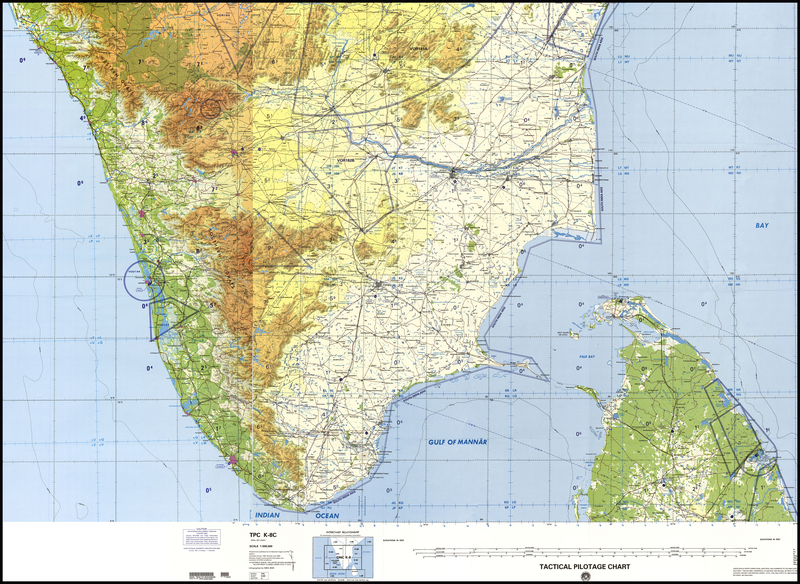 Tactical Pilotage Chart (TPC) of southern India featuring sheets TPC- K8C and TPC-K8d. 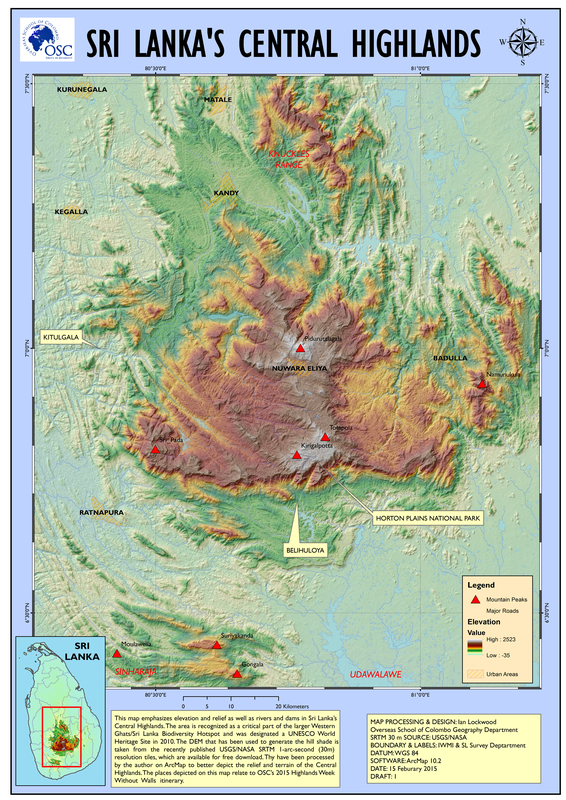 Published by the US National Mapping & Imagery Agency with revisions in June 2000. Sourced from the Univeristy of Texas Library. Lockwood, Ian. “Hypsometric tinting of the Southern Western Ghats Landscapes.” Ian Lockwood blog. August 2013. Web.